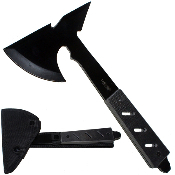 11" Black All Steel Camping Throwing Ax with black cord wrapped handle. Features a 3.5" face with a razor sharp point on the other end. The G10 handle also features a pry bar point. Includes nylon carrying case.